Risparmia $20.00 scegliendo ora questa opzione. 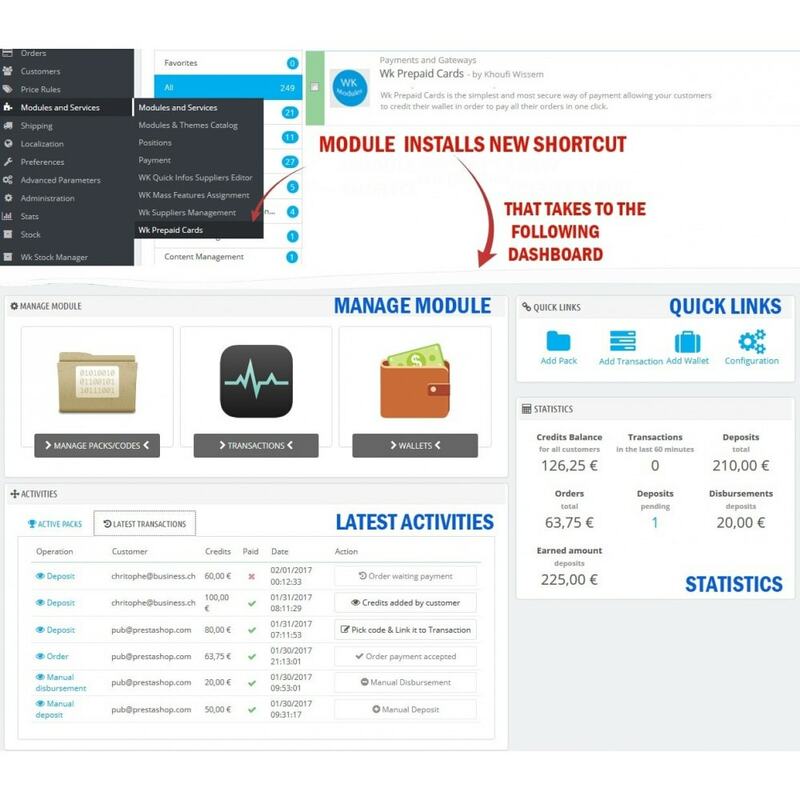 This module is a secure way of payment allowing your customers to credit their wallet in order to pay their orders in one click! Offer a simple, efficient and secure new payment method to your customers! 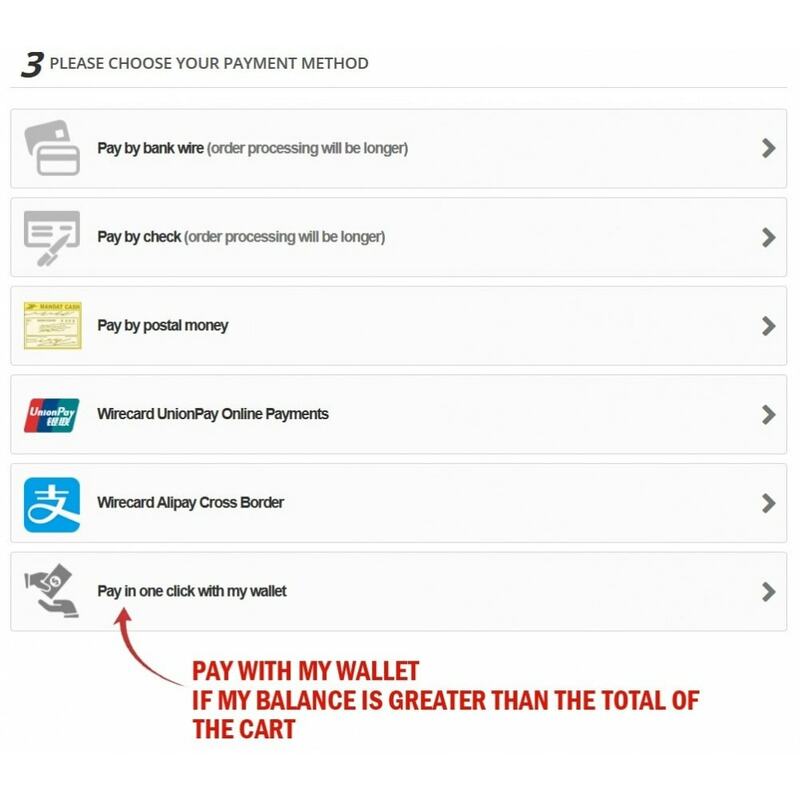 Allow easier and faster purchases for your customers with one-click payments and multiply your sales! The money of an account of a prepaid card is managed in an electronic wallet which is a secure payment method. 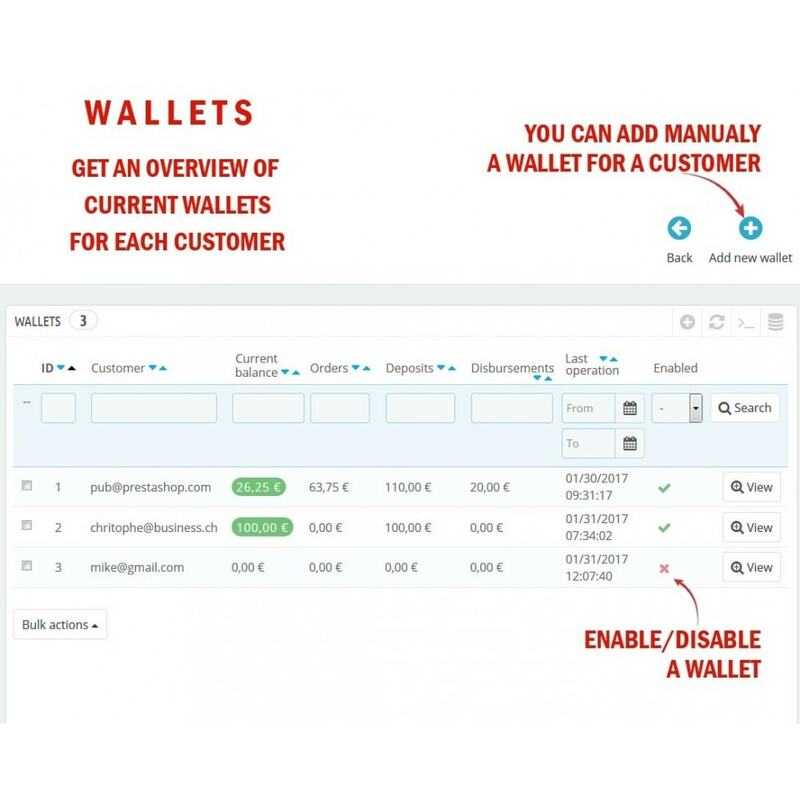 Keep an eye on all the transactions carried out on the wallets of your customers. 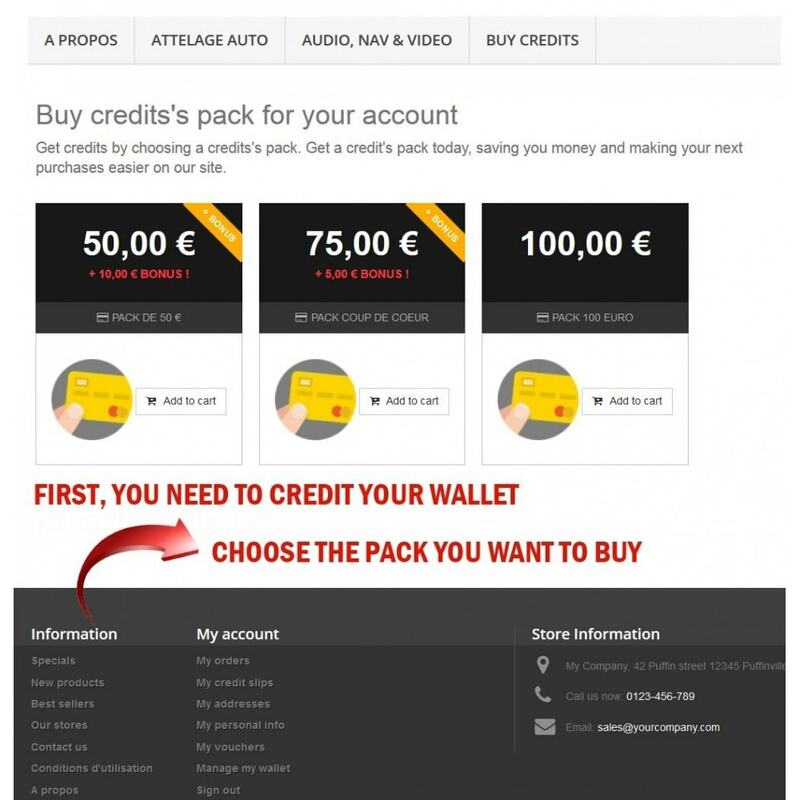 Follow step by step the system of validation of the purchased credits. Have a total control over the entire order process from creation to validation => no risk of Fraud. 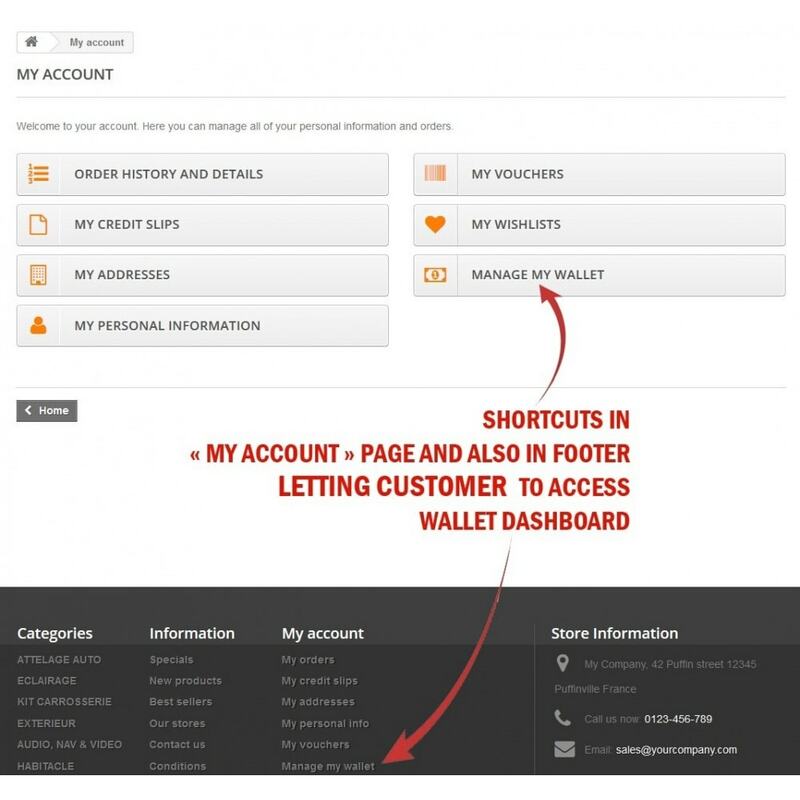 Manage customer's deposits, orders using wallet, credit disbursements by using our simple and intuitive interface. Direct deposit funds: when the pack is purchased, it is validated directly. 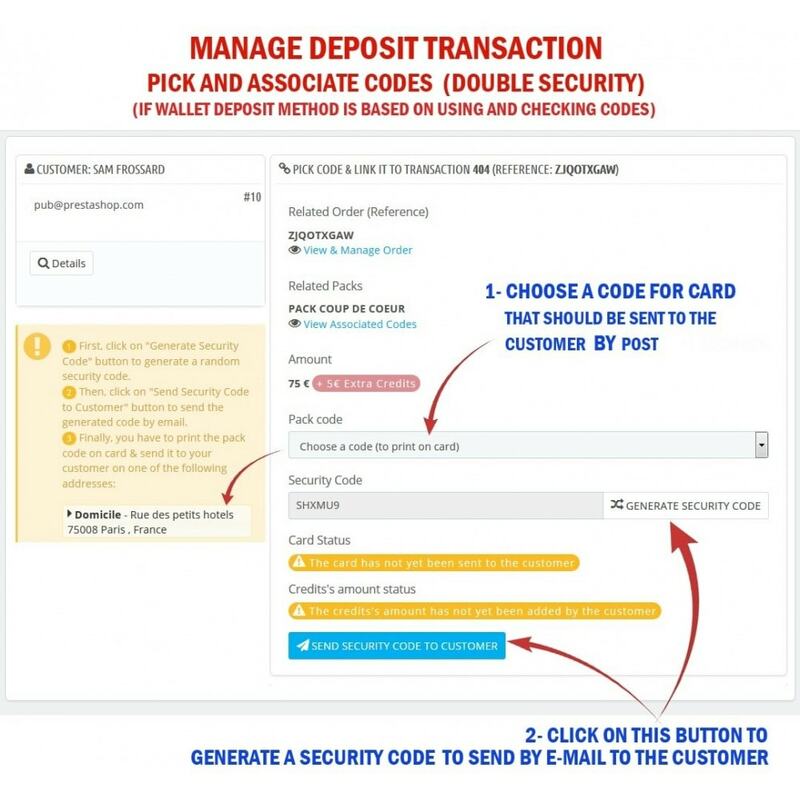 More secure deposit by using and checking codes: when the pack is purchased, it is validated only by customer using secure codes which are sent to him. Manage transactions on the whole wallets. Add manually deposit or disbursement transaction (deposit directly funds by hand for a customer). 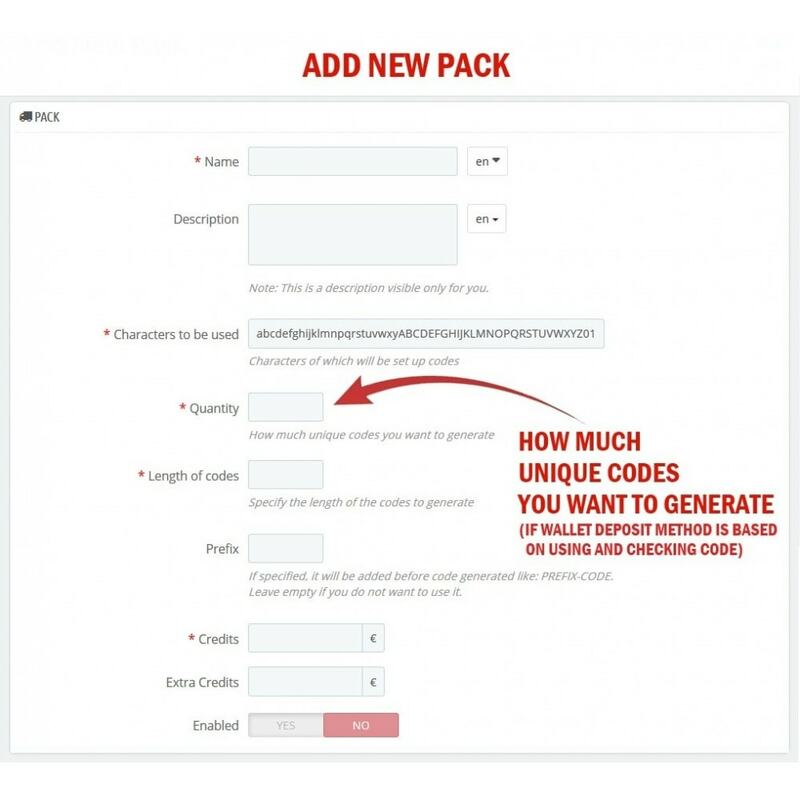 - Manage activation codes (for cards) and security codes. - Export codes in excel format to print on cards. - Pick and associate security and activation codes to transaction. - Send security code by email and prepaid cards by post to your customers to let them unlock the credits they have purchased. 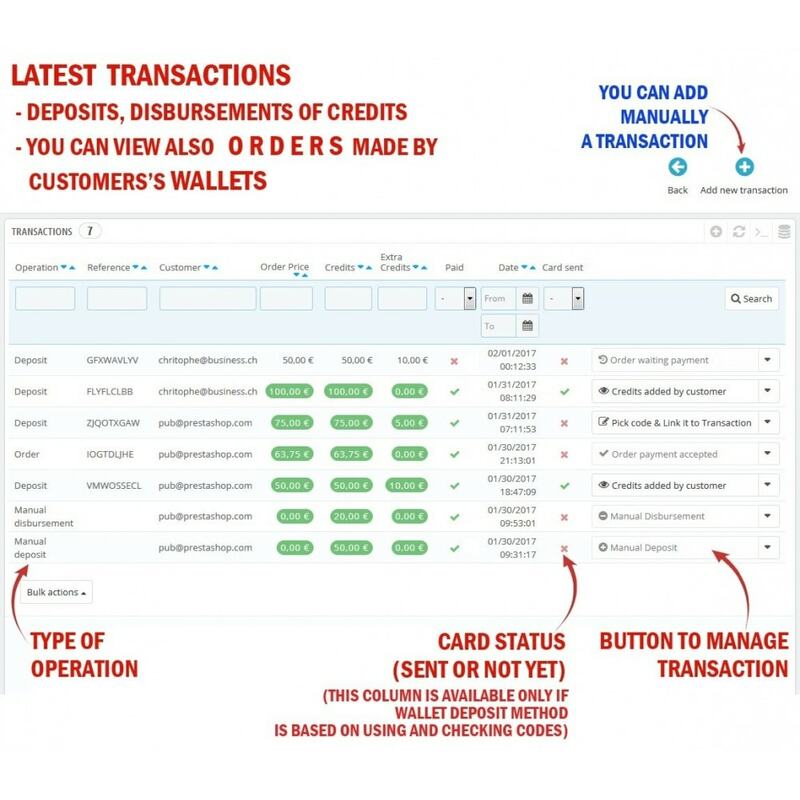 Provide a dashboard to customers in order to manage their wallet (balance, latest transactions, deposits of credits, sharing credits, validation of transaction to credit a wallet). 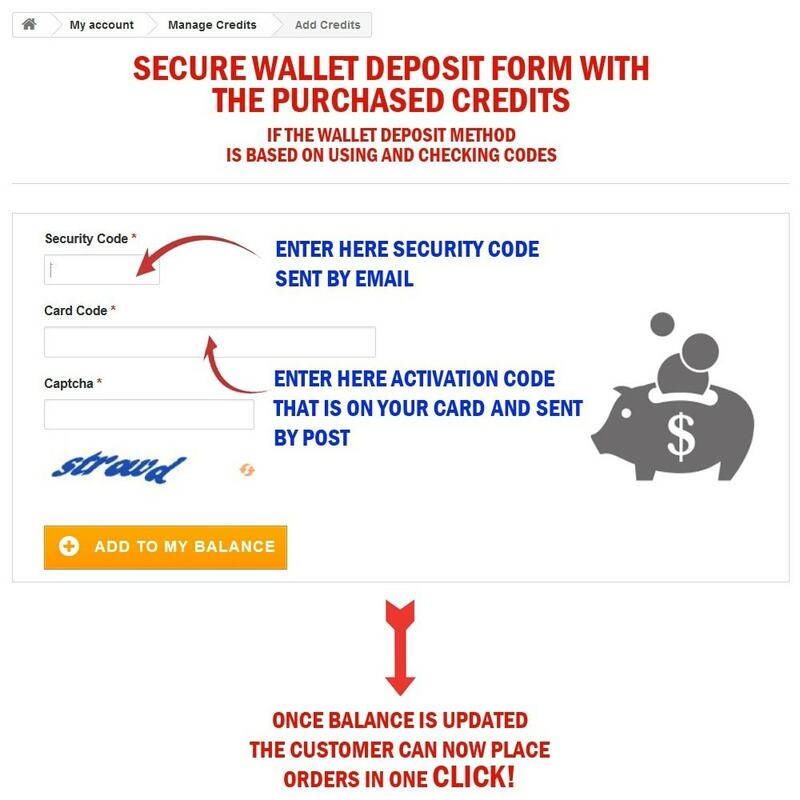 Fast and secure wallet deposit funds. 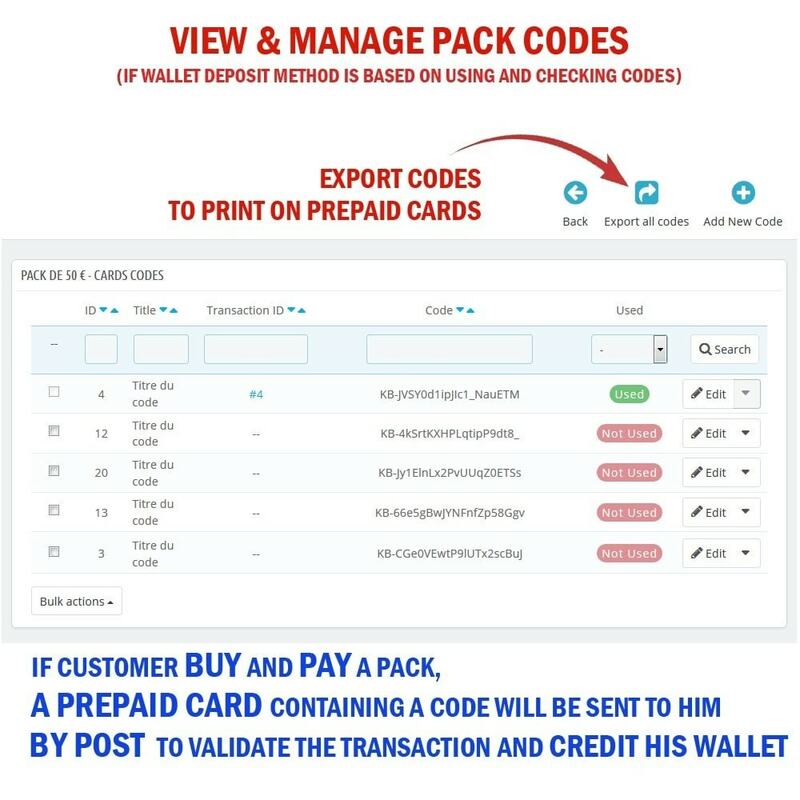 The customer pays a credit's pack, if payment has been accepted: 1) if wallet deposit method is direct, then the wallet will be credited directly by the purchased credits. 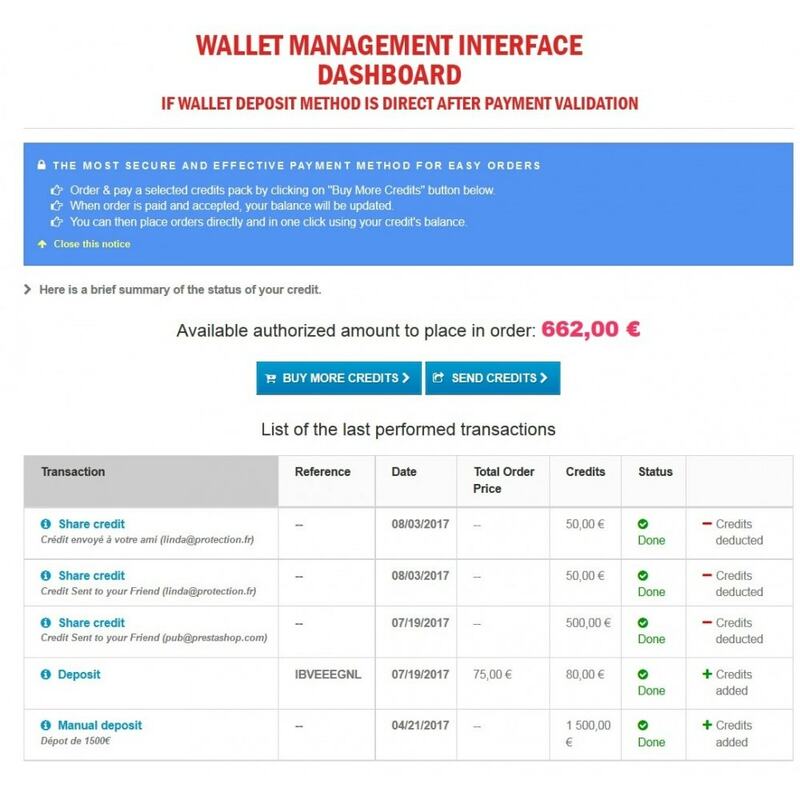 2) If wallet deposit method is based on codes validation, so the customer will receive 2 codes successively to validate and unlock the purchased credits (security code sent by email and a prepaid card sent to his postal address containing an unique code). 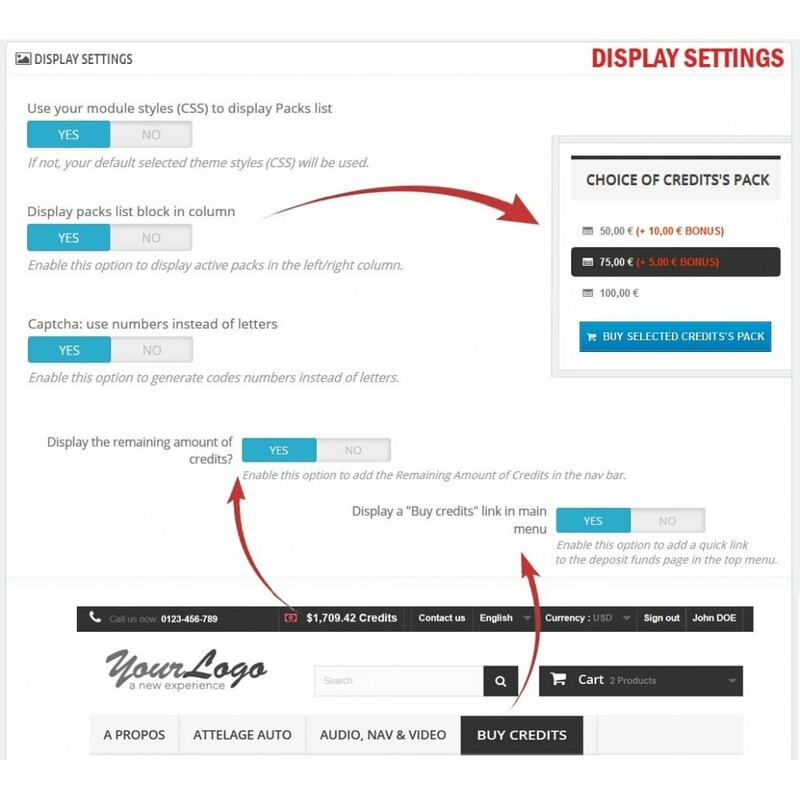 If you don't want your customers to pay for credits, you can authorize asking for credits through a form. 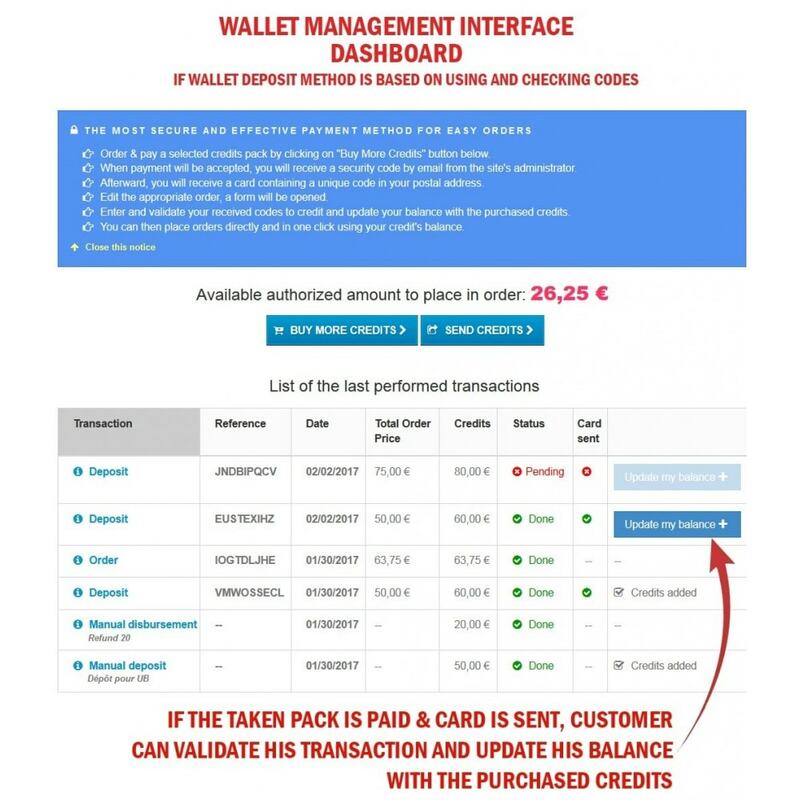 Customer can now place orders in one click using his wallet. 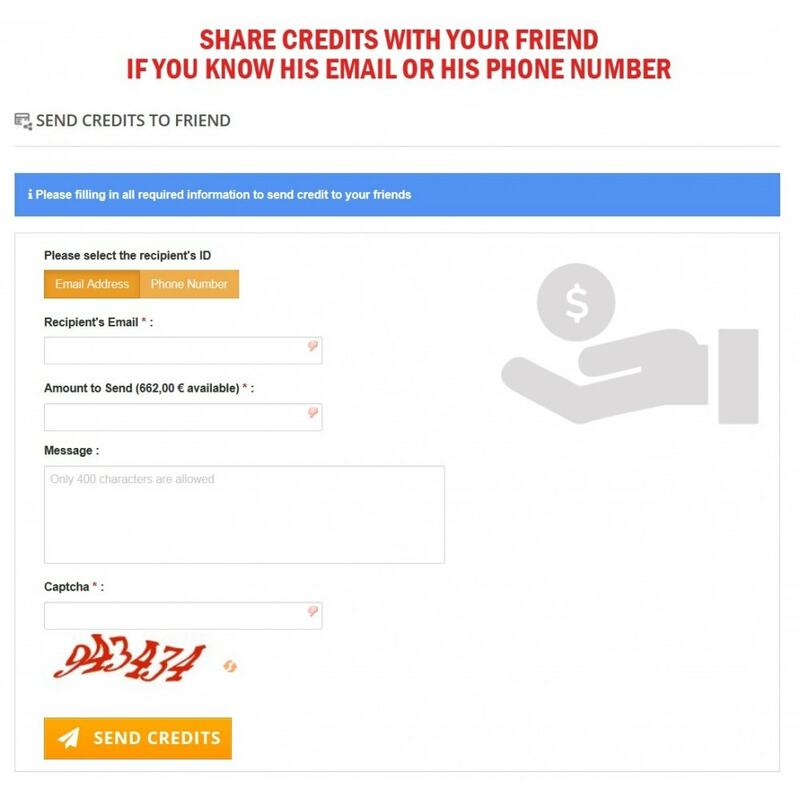 A customer can share credits with his friend. Questo modulo permette ai clienti di creare e gestire le liste dei desideri per selezionare i prodotti desiderati nel tuo negozio. È possibile visualizzare il blocco con le liste dei desideri in alto alla pagina. You must declare the amount of your different VAT monthly to your accounting firm or tax administration ?Want to track your sales month after month, year after year? This module is for you! Do not hesitate to contact us if you have any questions. We respond quickly. Order securely on the Internet, control your budget, etc. Be sure not to exceed the balance you have set. 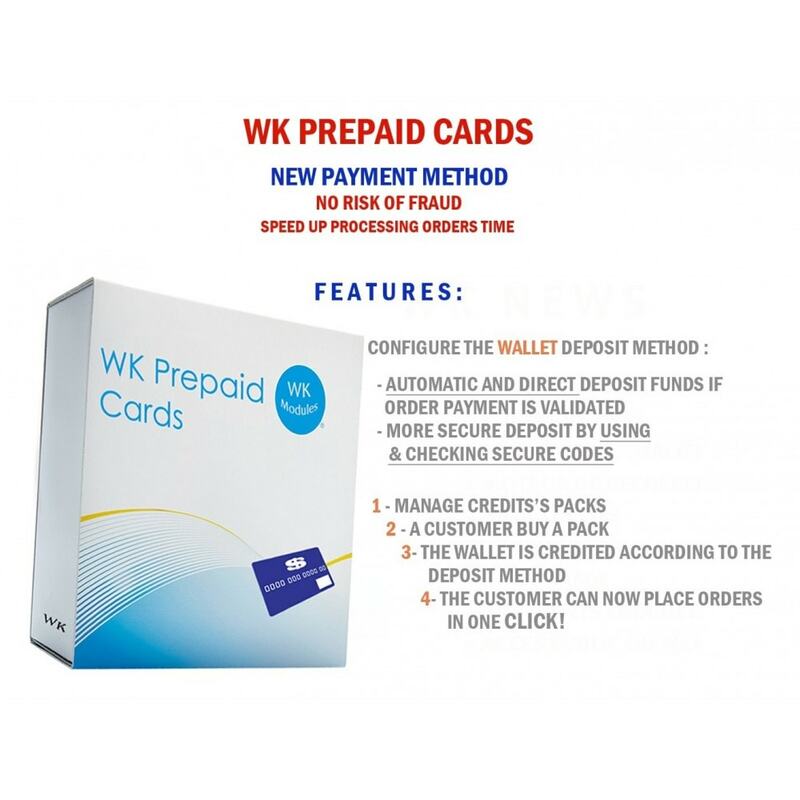 Prepaid cards are a way of emancipating banks. In addition, they represent a means of paying over the Internet in total security, since potential pirates can not go back to a bank account. 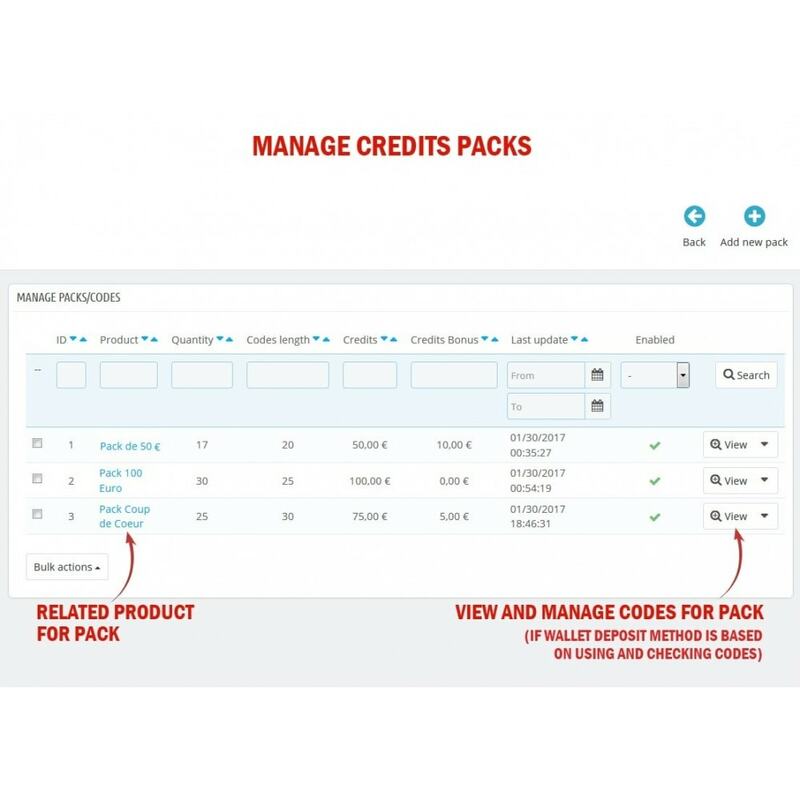 Request credits from administrator instead of buying pack's credits. Control through an option where to display the remaining amount of wallet in bar navigation. Add ability to export customers wallets and transactions into an excel format. Add ability to submit float prices when sharing credits with friends. If customer deleted, trigger a hook to remove also his wallet and transactions. Option to send an email to customer to inform him about manual deposit or manual disbursement transaction. Add ability to display the remaining amount of wallet in pdf invoices. Fix bug when displaying extra product tab.